Thanks to movies and television, most people have an automatic idea that comes to mind when they hear terms such as federal prosecution, federal crime or federal investigation. These images range from courtroom sketches of defendants in front of the judge, federal agents carrying boxes out of a business, and, of course, the infamous “perp walk.” These ideas don’t fully represent the totality of the federal criminal investigation process. While none of this is necessarily inaccurate, it is important to understand that these images are part of a much larger process. The entire process starts with an initial investigation. Understanding more about a federal criminal investigation can help a person understand what to expect if they are facing this situation. In any federal criminal case, the first step is a thorough investigation. This is designed to gather and provide U.S. Attorneys with the evidence necessary to prove the crime in question. The majority of federal investigations require a private home or other privately owned property to be searched to secure evidence. As a result, federal agents have to take the proper steps to make sure they don’t violate the Fourth Amendment. The Fourth Amendment prohibits illegal searches and seizures. This means that the agency handling the case will have to secure a search warrant first. To acquire a search warrant, the investigating agency has to be supported by probable cause that is secured from a federal judge who is “neutral and detached.” The evidence gathered during the investigation will be suppressed in court if federal law enforcement fails to take this important step. It is also likely the court will declare the evidence inadmissible when the case is tried. The federal prosecutor receives all of the evidence gathered after the investigation and evidence gathering process are complete. Then the federal prosecutor examines everything presented and determines if the government should present the case to a federal grand jury. If you are currently under investigation for a federal crime, you should consider speaking with a skilled legal professional. Furthermore, you should accomplish this as soon as you can. They can outline your options and help to protect your rights. Selecting the right criminal defense lawyer in Miami is an important decision so make sure to take your time and find someone who is capable of handling the situation. This will also ensure you truly understand the federal criminal investigation process. 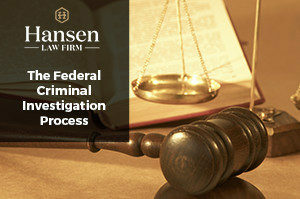 To learn more about criminal defense, or to discuss your situation, contact The Hansen Law Firm in Miami.